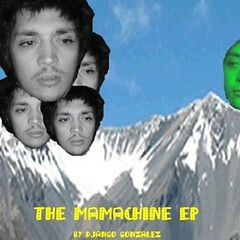 RAMIN TON: RTN013: Django Gonzalez "The Mamachine EP"
RTN013: Django Gonzalez "The Mamachine EP"
Finally! This is the first of three Django Gonzalez releases on Ramin Ton! "Mamachine EP" is a collection of originals, a voyage through different states of consciousness and unconsciousness. Songs that tell stories about city-ramblers, small-town-angst, clowns and criminals, hidden places and unmasked attitudes having fights with themselves in front of clear cut horizons of never ending self-punishment. But even a shimmering light, a strangly glowing something appears in between the tentacles of mother hometown, mamachine. mamachine is ein hit! das steht fest! ich frage mich warum hier keine lobgesänge in kommentarform gehalten werden!! hopefully django gonzalez will be back early enough from his aserbaidjschan-simbabwe-tour, where he is playing some shows at the moment, to see that ramin ton illegally released his record. maybe i´ll send him a fax with my faxgerät, cause he´s got a mobile faxgerät, because handys don´t work in aserbaidjschan. and internet don´t work in aerbaidjschan, too. and in simbabwe also not. but i give you some insider-information from django gonzalez and his tour and his mood and his plans for the future: his mood: not so good. but his tour is working werry well. there are many new fans to count in those economically uprising countries, which means that django gonzalez will be famous in the whole world when simbabwe and aserbaidjschan together overtake world-leadership. so be prepared for big stadion-shows of django gonzalez hitting the stage together with his alltime favourites and greatest artistical inspiration bon jovi in proximately late 2125 a.D.
oh and he just send me a fax, wher he says that he didn´t write that song "mamachine". marcel reich ranicki did. so this is a confession, and i go now sleeping.